The ninth annual Japan Film Festival Los Angeles will be held from May 11 to 26 at various Southern California venues. JFFLA started out in 2003. It was originally based on the theme of “chanoma,” a family gathering place in the living room, and showcased heartwarming films that portray the everyday life of a Japanese family. The festival has evolved to include a wider variety of genres, all of which portray a different aspect of Japanese culture. To reflect these changes, the name was changed from Chanoma Film Festival to Japan Film Festival Los Angeles in 2008. The 2013 JFFLA will provide an opportunity for American audiences to see what Japan is all about and for Japanese people to look at their own culture from different perspectives and reflect upon what it means to be Japanese. “Strawberry Fields” — When three of her classmates turn into ghosts, a fleeting heart-to-heart moment of spiritual exchange in farewell unfolds for a high-school girl in this coming-of-age fantasy, vividly depicted in a flood of nostalgia. With full cooperation from the City of Tanabe in Wakayama Prefecture, shot completely on location in Tanabe’s natural old-style townscape. “Living in Japan” — Director Shusuke Kaneko shows a day in the life of a teenage girl, interspersed with videos submitted by the public that represent things that come to her mind as she moves through her day. The elderly of Yoronjima Island pray for a rich harvest. Children play sports. Women anticipate the birth of their unborn babies. Juxtaposed with these scenes are images of devastation wrought by the 3/11 earthquake and tsunami. Yet despite the deep scars left by the disaster, the people of Japan seek a return to the traditions and rituals of their daily lives. “Japanese American History Unknown” — Japanese Americans have suffered untold racial discrimination in their homeland, but their worst suffering began after the attack on Pearl Harbor, when the U.S. government reclassified them as enemy aliens and sent them to internment camps. In Europe, soldiers of the 442nd Regimental Combat Team risked their lives to prove their loyalty with their blood. Members of the Military Intelligence Service fought in the Pacific, including the homeland of their parents. Some faced their own brothers, forced to fight by Japan. 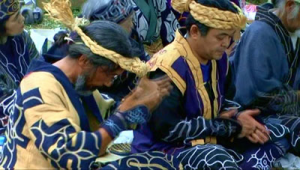 “Tokyo Ainu” — The Ainu are an indigenous people of Japan whose homeland is the northern island of Hokkaido. Their history is similar to that of other indigenous peoples throughout the world — dispossession, assimilation, marginalization, discrimination, loss of culture, and uncertain survival. After World War II, many Ainu left Hokkaido in the hope of leaving their traumatic history behind and finding a new life in large cities, mainly in and around Tokyo. This film weaves a tapestry from a wealth of voices, telling a story of how the Ainu diaspora in greater Tokyo came together to form a community, and what aspirations drove them to hold on to Ainu tradition away from their homeland. “Little Wing” — After the terrible disaster in Fukushima, Misaki and her son Yamato have evacuated to Tokyo. Still young, Yamato wants to learn karate to gain strength and confidence, but Misaki won’t let him – even though she used to love karate. One day she meets Kiryu, a former companion in her own study of the martial art. Kiryu, now the master of a dojo, wants to teach Yamato, but crisis comes to the dojo and Misaki refuses, seeing karate as a negative influence. Amid these continuing troubles, Yamato’s own inner strength begins to influence the adults little by little. “Heaven’s Story” — Stories are told from the multiple perspectives of murderers, their victims, and those surrounding them. Their seemingly random encounters take the victims and perpetrators through myriad emotions, ranging from anger, remorse and vengeance to redemption and forgiveness. The complexity of these emotions lays bare the human condition, confronting the audience with this question: Can everything be polarized into good or evil? Throughout its nine episodes, the movie explores various philosophical issues and dares to go where no conventional feature film has gone before. 12 p.m.: “Strawberry Fields” (ストロベリーフィールズ), directed by Takafumi Ota, who will appear in person. 4 p.m.: Submission screening, feature film — “Suika3 Yggdrasil” (好夏３星空のユグドラシル), directed by Yuichi Kondo. 5 p.m.: Submission screening, short films — “Control” (コントロール), directed by Eiji Tomichi (USA); “Ruin” (HAIKYO), directed by Chris Todd (New Zealand); “My Heroes” (マイ・ヒーロー), directed by Eiji Tomichi; “Three Days in Kamakura” (スリー・デイズ・イン鎌倉), directed by Alec McAulay (Japan); “Dusk” (ダスク–夕闇–), directed by T.J. Yoshizaki (USA). 10:30 a.m.: “The House of Rising Sun” (朝日のあたる家), directed by Takafumi Ota, who will appear in person. 1 p.m.: “I Will Blaze a New Trail” (僕のうしろに道はできる), directed by Yasuko Iwasaki. U.S. premiere. 2:30 p.m.: “Casting Blossoms to the Sky” (この空の花 – 長岡花火物語), directed by Nobuhiko Obayashi. 5:30 p.m.: Director’s talk with Nobuhiko Obayashi. 12:40 p.m.: “Japanese American History Unknown” (誰も知らない日系アメリカ人の歴史), directed by Junichi Suzuki. 1:30 p.m.: “Tokyo Ainu” (TOKYOアイヌ), directed by Hiroshi Moriya. 7 p.m.: “Little Wing” (リトルウィング), directed by Kenji Kurata. U.S. premiere. 6 p.m.: “God and Atomic Bomb” (神と原爆), presented by Nagasaki Broadcasting Co.
3 p.m.: “Kaku Koto no Omosa – Sakka Satou Yasushi” (書くことの重さ~ 作家佐藤泰志), directed by Hidetaka Inazuka, who will appear in person. Note: No English subtitles. 5 p.m.: “Heaven’s Story 1” (ヘヴンズ・ストーリー 前編), directed by Takahisa Zeze. L.A. premiere. 7:30 p.m.: “Heaven’s Story 2” (ヘヴンズ・ストーリー 後編), directed by Takahisa Zeze. L.A. premiere. 12:15 p.m.: “Hafu: The Mixed-Race Experience in Japan” (ハーフ – 現代日本での多文化的な経験), directed by Megumi Nishikura and Lara Perez Takagi. 5 p.m.: “Happy! People in the Media” (Happy!メディアな人々), directed by Toru Ichikawa. U.S. premiere. 5:45 p.m.: “Finding Refuge in Ishinomaki” (石巻市立湊小学校避難所), directed by Keizo Fujikawa. U.S. premiere. For reservations and more information, including synopses and trailers of the films, visit www.jffla.org.